Come Nov 1, MediShield Life will be launched for all Singaporeans and permanent residents (PRs), providing welcome protection for them against medical bills for life, regardless of age or health condition. MediShield Life replaces MediShield, a hospitalisation and surgical (H&S) insurance plan that covers patients in class B2/C wards in public hospitals. The cover under MediShield Life is automatic and will include those currently covered by MediShield, private H&S plans, the uninsured, and those with pre-existing medical conditions. This is a welcome enhancement as the MediShield scheme excluded pre-existing conditions and the coverage was only till the age of 92. Like MediShield, MediShield Life is targeted at class B2/C coverage. But it provides better protection by having higher limits for inpatient treatment, day surgery and outpatient cancer treatment, higher cancer limits, no lifetime limit and lower overall co-insurance, while maintaining the same deductible. This means MediShield Life will pay more of the hospital bill. Every household should have received a MediShield booklet by this month, which provides information on MediShield Life, its benefits, premiums and subsidies. It also explains how Integrated Shield Plans (IPs) work and how the Additional Withdrawal Limits will work. Today, about six in 10 Singaporeans have IPs. The Central Provident Fund (CPF) Board is the administrator of MediShield Life on behalf of the Ministry of Health (MOH). 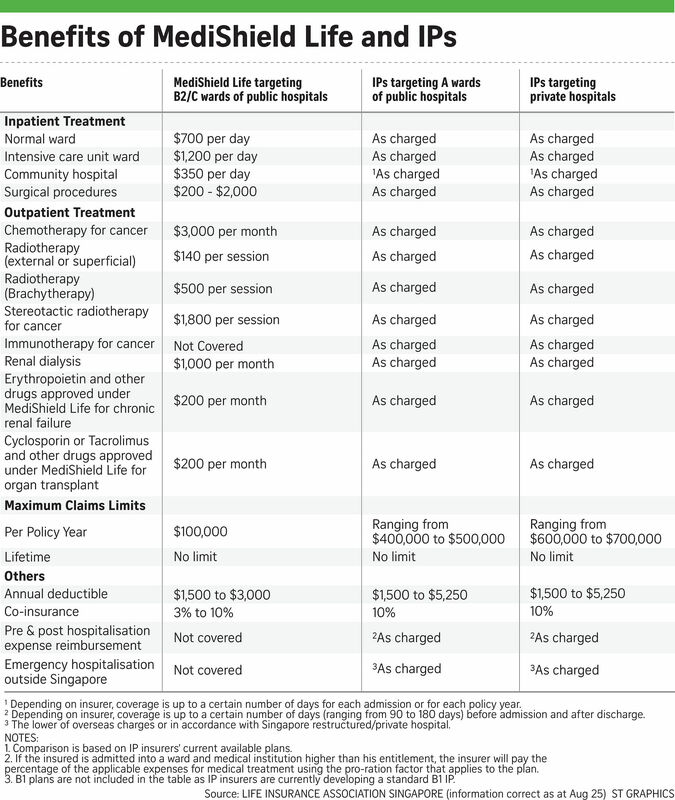 HOW MUCH WILL MEDISHIELD LIFE COST? With better benefits, MediShield Life will come at a higher cost than MediShield, ranging from a small 11 per cent rise for older people to a trebling of premiums for young adults. For example, for a person aged between 31 and 40, the annual MediShield Life premiums would be $310, up from $105 under MediShield. But help is at hand for various segments of the population. To help pay your premiums, the Government will provide support via premium subsidies for lower- to middle-income households, Transitional Subsidies for all Singapore citizens, Pioneer Generation premium subsidies and additional premium support for the needy. A permanent feature for Singaporeans and PRs, these subsidies are for lower- to middle-income households. However, PRs will receive half the applicable subsidy rates of Singapore citizens. Given to all pioneers for life, these Singaporeans will receive subsidies between 40 and 60 per cent, depending on age. Pioneers will also receive annual Medisave top-ups for life, ranging from $200 to $800 each year. With both the Pioneer Generation Subsidies and Medisave top-ups, all pioneers will pay less for MediShield Life than for MediShield today. Available for the first four years of MediShield Life, Transitional Subsidies are only for Singapore citizens, regardless of household income, annual value of homes and number of properties. In the first year, Transitional Subsidies will cover 90 per cent of the net increase in premiums, after taking into account other premium subsidies. These subsidies will reduce and cover 70 per cent, 40 per cent and 20 per cent of the net premium increase in the second, third and fourth years respectively. To check out your estimated MediShield Life premiums and subsidies, use the premium calculator at www.medishieldlife.sg/calculator. For those who cannot afford their premiums even after subsidies, the Government will provide additional premium support. This will ensure that no one will lose coverage. A person may have to pay additional premiums if he has a pre-existing condition - a medical illness that he has before he is covered under MediShield or a private integrated plan. For those with serious pre-existing conditions, a flat additional premium of 30 per cent of life premiums is payable for 10 years to reflect their higher risk. Examples of these medical illnesses include stroke, cancer, kidney failure and heart diseases. Details on who or which conditions will be subject to this premium loading will be finalised soon. These are private H&S plans comprising a basic MediShield component (to be converted to MediShield Life automatically on Nov 1) and an additional private insurance component. As such, there is no duplication in coverage between MediShield and IPs. IPs provide higher protection that cover the B1/A wards of public hospitals and private hospitals. They are managed by private insurers under different product names, namely AIA (HealthShield Gold Max), Aviva (MyShield), Great Eastern (SupremeHealth), NTUC Income (IncomeShield) and Prudential (PRUShield). If you have an IP, your insurer will inform you of the total premium, which includes the portion for MediShield Life. This portion will be channelled to CPF Board by your insurer. As such, there is no double payment of the MediShield Life premium. The good news is that you will be covered up to MediShield Life benefits for any pre-existing conditions, including those excluded from your IP. You may use your Medisave to fully pay the MediShield Life component of your IP premium, including any additional premiums resulting from the cover of serious pre-existing conditions. Medisave used for the additional private insurance component of your IP will be subject to an additional withdrawal limit set at $300 (below age 40), $600 (turning 41 to 70) and $900 (turning 71 and above). You will need to pay your MediShield Life premiums at your next policy renewal on or after November. If you are currently covered by MediShield only, the CPF Board will inform you on your premiums and subsidies at the next annual renewal. For those who own an IP, you will be informed by your private insurer when your plan is up for annual renewal. If you are currently uninsured, the CPF Board will inform you about your new MediShield Life coverage, premiums and subsidies, as well as additional premiums (if you have the applicable serious medical conditions), by October . Everyone has unique financial and medical circumstances and needs. If you are deciding whether to keep or opt for IPs, here are some questions posed by Mr Apelles Poh, senior financial services director at Professional Investment Advisory Services. •Is comfort important to you? You can enjoy more privacy with cool comfort with an IP whereas MediShield Life covers B2/C wards which have more beds and no air-conditioning. •Is speed important to you? Mr Poh highlights that one can usually make an immediate appointment to see a specialist at a private hospital, while it could take much longer to be referred to a specialist at a public hospital by the polyclinic. If you are suffering from an aggressive medical condition, the time saved could be critical. •Is the choice of doctors important to you? With IPs, you can choose your doctor, for example your own gynaecologist, to operate on you in a private hospital. Not so for MediShield Life. •Is "as charged" (no sub-claim limits) and a fully covered plan important to you? With an IP, you can pay for a rider that covers both the deductible and co-insurance components of a hospital bill. •Is covering out-of-pocket expenses incurred during pre- and post-hospital treatment important to you? MediShield Life will not cover such bills. •Can you afford the premiums? Premiums for IPs are relatively low when one is young but they increase with age. One option is to downgrade the plan as you grow older, for example, after 65. The Life Insurance Association Singapore (LIA) adds that with an IP, you enjoy higher annual limits on coverage and are also covered for emergency hospitalisation outside Singapore. MOH suggests that individuals keep in mind two broad factors when considering an IP. First, the type of ward they prefer to stay in if they are hospitalised and whether they wish to choose their doctor. Second, whether they can afford their IP premiums in the long run, as they increase with age. The ministry also noted that while MediShield Life premiums are fully payable using Medisave, the additional private insurance component of IP premiums is only payable with Medisave up to a certain limit. Depending on your age and plan, you may need to pay part of your IP premiums in cash. •Up to $8,058 from ages 89 to 90, or five times MediShield Life premiums. The corresponding MediShield Life premiums for these age groups are $310, $815 and $1,500 respectively (before subsidies are applied). Some may wish to have an option of enhanced coverage beyond MediShield Life, but in a standardised, affordable and easy-to-understand package. This is why MOH is working with insurers to develop a Standard IP with benefits pegged at class B1 wards in public hospitals. To be launched in the first half of next year, this will allow those concerned about premiums to buy or keep an IP. The five private IP insurers have promised to freeze premiums (not applicable to riders) for a year following the launch of MediShield Life. However, premiums are expected to go up after the first year, according to LIA. This is because IP claims have escalated by an average of 12 per cent (involving public hospital class B1 and A wards) to 17 per cent (involving private hospitals) a year in the past few years, with private hospital claims rising the fastest. Said an LIA spokesman: "Claims for IPs have increased over time due to larger medical bills, greater healthcare consumption and greater use of newer and costlier procedures resulting from medical technological advancements." LIA added that based on IP insurers' experience, the average bill size from private hospitals is about two to three times that of the average bill size from public hospitals. The average bill size from private hospitals is also increasing at a faster rate than those from public hospitals. IP insurers monitor the impact of claims escalation and bill sizes very closely and review their premiums and benefits on a regular basis. The last review was in early 2013. MOH suggests a two-prong approach to prevent the escalation of total healthcare spending. "The first approach is to transform our model of care to be less reliant on acute hospitals, more integrated with primary care and more centred on the patient in the community and home," said an MOH spokesman to The Sunday Times. "Healthcare delivery should allow patients to receive care that is more effective, less costly and in more appropriate settings." The second approach is to ensure there are right incentives for healthcare providers, doctors and individuals to deliver care appropriate for what the patient needs and avoid the problem of over-consumption. MOH added: "We want to avoid a situation where doctors order more tests than necessary because the bill will be paid by insurance. We should ensure that treatments are clinically necessary and cost-effective. The concept of co-payment also reinforces this discipline." The ministry is also working towards improving pricing transparency for hospital services, so Singaporeans can make more informed choices. Since 2003, MOH has been publishing total hospital bill sizes for common conditions in public and private hospitals. Last year, MOH started publishing the total operation fees in public hospitals on the MOH website. LIA says IP insurers will seek effective and innovative ways to improve price transparency and comparison of professional fees within the healthcare industry, as well as use in-depth data analytics to scrutinise unusually high bills to better manage claims costs and keep premiums affordable for all.